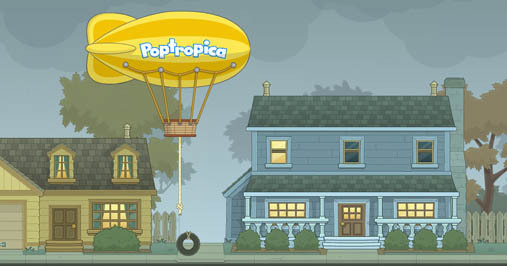 The Magic Tree House has landed on Poptropica! Join Jack and Annie on a journey back in time to a world of samurai warriors, sumo wrestlers, and even greater dangers that lurk in the clouds. When trouble strikes, it's up to you to master a set of elite ninja skills and undertake a dangerous rescue mission. Can you find your way back home, or will you be stuck in the virtual world of old Japan forever? Yawn. Bo-ring! Let's become ninjas! But first, you'll have to go right until you reach a tire swing. Enter to reach the backyard. You'll see some "magic dust" passing the roof of a house and then you'll meet Jack and Annie, the main characters of the Magic Tree House books. They'll head to a tree house. Walk right until you get to the tire swing. Click on the rope to cut it and drop the tire. Now push it to the left. Take the tire through town and head to the next area, to the left (the Woods.) Now, (gasp, wheeze!) push the tire into the woods, over the hills, and underneath the wooden ladder, heading up to the Magic Tree House. You'll see a pair of red glasses on the ground. Pick them up, and jump up on top of the tire. Whooo! You'll catch some huge air and land on the ladder. Climb up, go in, and you'll soon find Jack and Annie there. Talk to them, and then USE the glasses you found earlier to help Jack see. Go left and pick up Frog Creek, Pennsylvania: Hometown USA. What? 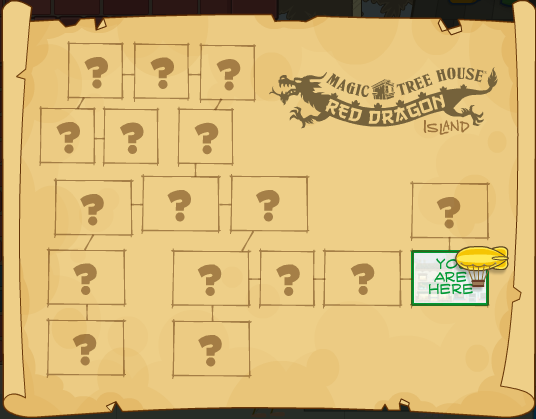 And wait, how does this "magic" tree housework, anyway? Ask Annie. Then, a book will appear to her right, called A Journey to Old Japan. Pick it up, USE it, and then get set for an exciting journey to ancient Japan! What's happening to the tree house?! Oh, we're in Japan. Or in the Imperial Garden east of Edo to be exact... Leave the tree house. Jack and Annie are with you and are already dressed. They're ditching you! Fortunately for you, Jack has given you a magic amulet, which will take you back to the tree house any time you please. Follow them, across the pond, and you'll soon find two samurai guards. Talk to them. Uh-oh. You have no passport! You'll be thrown into a jail cell. Why did you even accept this quest? Now, thanks to Jack and Annie, you've got a criminal record! But stop whining. We're going to blow this Popsicle stand soon enough! USE the amulet to get back to the tree house. Whew! Glad that's over. Hmm... Never thought it would be this simple to get out of jail... Now run left, and into the Bonsai Shop. Talk to the lady there. Ask her about a kimono, and she will let you borrow one of hers. Choose any color you like. They've got red, yellow or blue. I chose red. Put it on (actually, you don'y even have to do this. Just click COSTUMIZE and click CANCEL), and good for you... there's a passport in your pocket! Now that you look like a citizen, and have a passport, you can waltz past the guards. Go all the way left to enter the next area. Jack and Annie are there. Those scoundrels! Just wait 'till I have a word with them... Oh, great. Just when you thought your luck was turning around... the samurai guards have caught Jack and Annie without passports. Now you have to rescue them! Follow them across the bridge to the next area, East Edo. Talk to the lady there. She will tell you where they might have went. You'll find a poster of the evil shogun, too. Ignore it for now... Go up the stairs and get the Rotten Fish. (Yecch!) Now enter the prison, go right, and Annie will drop a letter. Read it. Uh-oh... that rotten shogun found her magic wand! And who's this Basho guy? We'll find him soon enough... Leave the place, drop down, and go left, past the dragon. Keep going left past the falling flowers. Jump onto a rock near the water and grab the Bag of Mortar. Keep going and duck into the hut. That's it! The guy last on the line is the criminal (for stealing fish.) 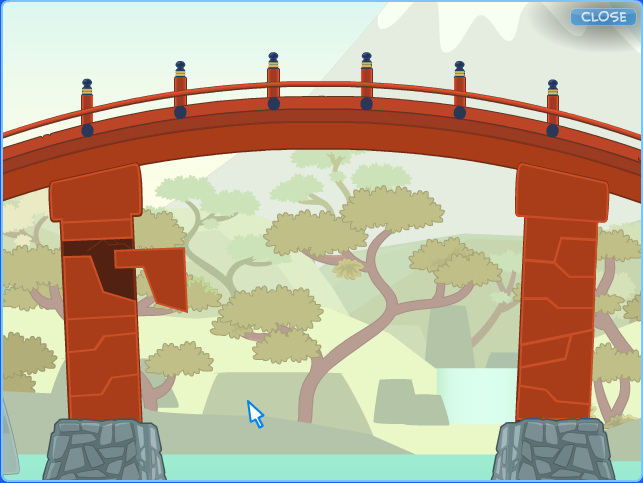 The Samurai will give you his Betting Slip for the Sumo Match... remember the Sneak Peek for this island? Go right and over the bridge. USE the bag of mortar near the old man, and he will give you a chance to rearange the bricks to keep the whole smash from collapsing. This part is simple... all you gotta do is match up the bricks like a puzzle. See the screenshot for the complete thing. Once you're done with that, you'll see a bunch of humorously fat sumo wrestlers go by the bridge. One will drop some Bonsai Scissors. Collect them, then go right, drop down, go left, and onto the guy's boat. Then USE that horrible dead fish you found on the steps. now click on the frog so until he jumps to the pad where the bubbles are. These instructions may or may not work exactly, you may have to play with the frog a little. That man is as rotten as the fish you used! He's taking credit for everything! Never mind... just hop up and go right. return to the Bonsai Trees Shop (where you got your kimono.) Help that poor blind woman by cutting her bonsai to match the drawing. Click FINISHED when you're done. (TIP: The shading of the leaves really helps.) Done? Good. Now that you've "mastered the skills of bonsai trimming", you will see a man come in, asking to buy a plant for a competitor in the Sumo wrestling match. She will sell it for 100 ¥. Now leave the place and go left. This game is much different than the Sneak Peek game. You have to actually punch and avoid the wrath of your opponent... without getting pushed off the ring yourself! This part is similar to defeating Crusher in Super Power island; you have to jump up when the hits the ground to avoid being shaken off. It's okay if you get a few hits. The point is, you have to avoid him, and when he comes charging at you, jump over him (like Speeding Spike in Super Power.) Do this enough times, and he will get mad and blow his head off. That's when you've won! Uh-oh. The Samurai is coming! He's blaming you for him losing his life's savings on the match. Wha?.. That's not your fault! He shouldn't have bet his money in the first place! And he wants to see your passport. Luckily, Basho comes just in time to save you. You will now be trained to be a ninja... Follow Basho out of the stadium and drop down to the ground. Then run left, past the falling flowers, and to the hut on the water. Basho will be outside. Talk to him, and you will be praised for helping everybody. Then you will be taken to training. Now you will enter Training Mode. It's pretty fun to use all those ninja tools. It's pretty easy to finish, but make sure to pay close attention, because you will need these later on. One quick tip: BE ALERT!!! Here's a quick recap you can look back to. Wall-Climbing Jump onto a wall to grab on. You can only stay this way for a few seconds. Stars Throw a star to knock something out. Enemies will notice you if you throw one of these. Press space while aiming with your mouse. Smoke Bombs Throw a smoke bomb to momentarily blind someone. Press space while aiming with your mouse. Grappling If you see a metal ring, click on it to grapple using it. You can use this to clear gaps. Bo Staff Press space while using this to block hits. Run while doing this to pick up speed, and press space and jump at the same time to vault. Ninja Vision This will let you scout out your surroundings. Very helpful! When you're done, meet Basho just outside the hut. 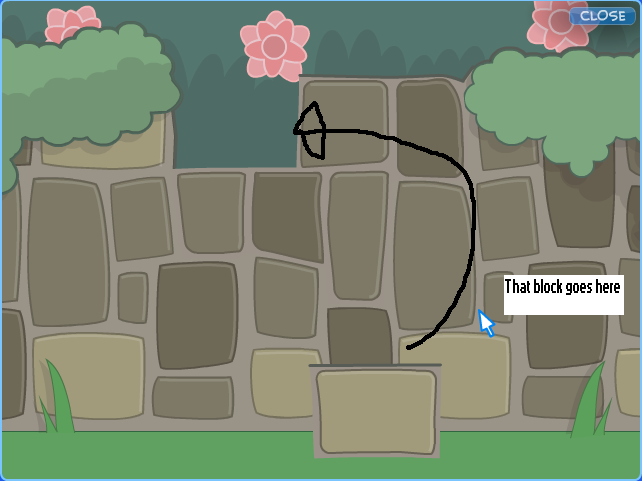 Help him fix the wall by dragging the pieces and fitting them together like a puzzle. This is almost exactly like the bridge-fixing part. Again, I have the puzzle guide here. Basho will (not) reward you for fixing his wall. He will also request you bring the shogun back to him. Now you have to rescue Jack and Annie. Wait... it's been so long I almost forgot abut those ditchers! Go right, past the flowers, and into the prison where you first found the (gag) dead fish. Go right, jump on top of the rocks, and wall-jump up and then go right. Keep going, then wall-jump all the way to the top of the hole. Forget about the first rope; just wall-jump to the right, climb up, and when you reach the rocks, keep jumping to reach the top. Get past the moving blocks by timing your jump carefully. You can also stand on them. When you reach the very top, hop to the left side and go left. Use your Ninja Vision to locate the guard down there. Drop down, then use the tear/smoke bomb to blind him. Go left, climb the wall, and then jump onto the window. Go into the building. Use Ninja Vision if you want, to spot the Samurai on the ground floor. Throw a star at the rope on the door to get it open. Go right, wall-jump up (don't worry, you'll get better at this as time goes on), go right again, and drop down. You can disable the guard below, but you don't exactly need to. I recommend you do. Grapple onto the hook there, and you can reach the other side. Go left, drop down, go left again, collect the note, and then vault over the spikes (using the Bo Staff). Drop down left, and keep going until you reach the wall. Jump up it, and jump off to collect the key. Walk right and get onto the platform. Disable the guard and run past him to the platform on the other side. Chuck a star at the rope to drop the heavy weight. Jump on it and grapple past the gap, to the other side. Wall-jump upwards, and jump to the left, then back to avoid the spikes. Go through the door, into area 2/3. Use the star to take out the light there. Basho will advise you to stay in the shadows to be unseen. Now go right, grab the wall, and shoot a star across the gap to take out the light. Hop onto the platform below, then make your way down the stairs. Blind the Samurai at the bottom, and drop down below. Go right and blind this guard, too. Keep going, and drop down to the lighted area. Go left to get off the platform you're on. Use the Ninja Vision to locate the guard and the small raised platform where you'll want to land. Jump onto it, and then use the ring to grapple over to the key. Get back to the platform you came from, and then chuck a tear bomb at the Samurai below. Slip past him and into another dimly lit area. Jump onto the platform there and go up. Collect the second part of the note you found earlier before climbing onto the rope, and then use it to climb up. Blind the guard there so he doesn't knock you off the rope. Keep going, and get onto the platform to the right. Wall-jump up the wall to the right, barely avoiding the spike pit. Jump onto the board on top of the spike pit there, and jump onto the platform above you. Go right, drop down, and enter the last area! Go a little right and shoot out the light. Then blind the guard below you and run right. Grapple to the other side. Careful, each of these rooms are much harder than the one before it! Go right and shoot down the bridge with your star. You can now cross it. Do the same to the next one , and disable the guard below you. Clear the gap and drop down (but hold on to the wall!) Now jump over and collect the key. Slide down, and disable the guard on the bottom floor. Pass him, and jump over the obstacle. Now go under the platform and collect the last part of the haiku. Then get onto the platform above you. Oh, no! The Shogun is using the wand of Di-what's-his-face to destroy you and Jack and Annie! But the dragon's wrath is out of control... can Annie convince the Shogun to return the wand? The answer: yes. Okay! You guys are free! But wait a minute... why is it so cold??? Oh, great. Annie managed to screw us up so bad we reached Mount Fuji. And now we have to get to some Cloud Dragon to stop him! Now climb up the mountain. When you reach the Dragon, climb on top. Now get ready for the toughest part of the island. Like beating the Shogun wasn't enough. Now you must stop the Red Dragon from destroying the city (by fire.) You, on the Cloud Dragon, have to use your Water Breath to extinguish the flames on the buildings, while also using it on the Red Dragon to beat him. Watch out for his fire breath, though! And you'll also need to fly into the clouds to refill your water. This is similar to the part in Mythology, where you have to defeat Zeus. The map up there can come in very handy, too. It will tell you where the other dragon is, and also where the buildings are and which ones are on fire. Remember, also focus your energy on spraying the Red Dragon. And whatever you do, DON'T RUN OUT OF BREATH!!! If you lose once, you can activate Easy Mode. This is probably what you'll want to use, because you don't lose any water breath. TIP: try to corner the Red Dragon so that you and him are chasing each other's tails. If you're in the back he will never burn anything and you'll be infinitely shooting at him. This only works for Easy Mode. When you're done, you will see Basho talking to the Shogun. Wait... they're BROTHERS!!! He tricked you... or not. "Let's get out of here before they start hugging us." (what Jack says.) Ha! Okay, now use the amulet to get back to the tree house. From there, you can leave Japan for once! Oh, yeah, you'll have to use the Frog Creek, Pennsylvania: Home Town USA book you got earlier. Wait... you still have it, right? What a ride! Hey, Jack and Annie, you don't think you forgot something... oh! There it is, your reward for risking your life to bring peace to the town of Edo. Congrats!! !